About 61⁄2" (16.5 cm) wide and 64" (162.5 cm) long. The Dizzy scarf is the result of wondering what would happen if I worked intarsia in garter stitch. I wound some black and white butterflies, cast on 30 sts, started swatching, and fell in love. 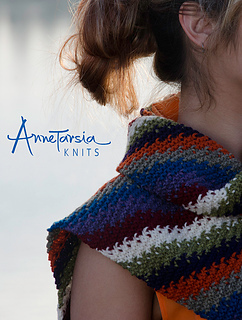 Annetarsia garter stitch creates a flat, fairly reversible fabric. 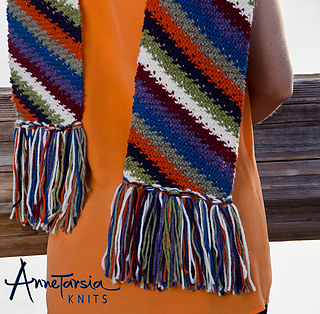 This is a wonderful stash-buster pattern, as different yarns can be used for each stripe. 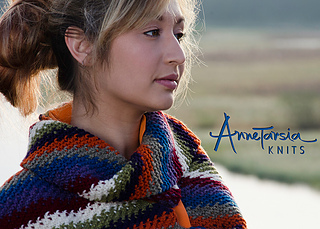 The knitting is fun, rhythmic, highly addictive, and requires no pattern after you have the technique down and the stripes established. The scarf is named after Dizzy T. Sheep and the Dizzy Sheep Groupies, a Ravelry community that has been extremely kind to me. 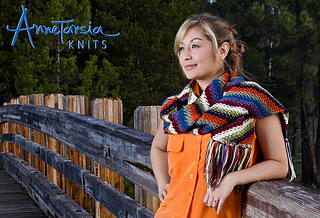 One skein of Cascade 220 in each color will make 4 scarves, so we split ours up into kits. The Cascade 220 color range is large enough that not all of the colors will be available at all times. The colors listed are the ones we used, but substitutions are part of the fun!